A common mistake in diagnosing our current predicament is to blame religion, when it’s not religion itself but a particular corrupt type of religion that’s blocking the path to our better selves. Once the focus shifts to theism as the type in question, a second mistake fails to distinguish between corrupt and healthy forms of theism, recommending that we simply push them all into oblivion. Wouldn’t we be better off without religion? What’s wrong with rejecting god once and for all, along with spirituality and everything sacred? Secondly, post-theism regards religion (from the Latin religare) as a system of stories, symbols, values and practices that “link” us to the grounding mystery within, to one another in community, and all of us together to the great turning mystery of our universe. In fact, reading those crucial linkages in reverse – first to the cosmos (nature), next to others (tribe), and finally to our own inner ground of being – charts out the sequence of stages in the historical development of religion itself: from body-centered animism, through ego-centered theism, and finally into a soul-centered post-theism. Religion needs to transform throughout this process, but even if it gets stuck at times (as theism has been stuck for a while now) its connecting function is something we humans cannot do without. You may not be formally affiliated with an institutional religion, but you are nevertheless working out connections that support the centered meaning of your life – and that is your religion. Lastly, in its deep appreciation of the functional roles of god and religion in the spiritual evolution of our species, post-theism differs from most forms of atheism by insisting on the necessary ongoing contribution of theism. Even after it has successfully awakened the individual to his or her own creative authority, and the virtues once attributed to the deity are now actualized in the individual’s own life-expression, it’s not as if theism can be simply abandoned and left in our past. There will always be more individuals coming behind us whose progressive liberation needs the support that only theism can provide. So that I can move the discussion out of the realm of official world religions and refresh in our minds the critical importance of theism in human development more generically, my diagram above illustrates the correlation between tribal religion and the original theistic system of the family unit. Freud was correct in seeing tribal religion as a societal model based in and projected outwardly from our early experiences of Mother, Father, and the sibling circle. Of course, nearly two thousand years earlier, Jesus (among other teachers) had conceived this correlation in his metaphor of god as “our heavenly father” and of our neighbors (including enemies!) as brothers and sisters of the same human family. It’s not a heresy, then, to acknowledge the equivalencies between the divine higher power of a tribal deity and the parental taller powers that shaped our earliest experience. Historically, depending on whether the principal deity was regarded as a (celestial) father or a (terrestrial) mother, the social system of his or her devotees tended to reflect that hierarchy of values – higher-to-lower (ordained) in patriarchal societies, or inner-to-outer (organic) in partnership societies. Societies (such as our own) that have been significantly shaped by the Judeo-Christian or biblical-patriarchal worldview tend to favor an ordained top-down hierarchy, which predisposed us for the longest time to assume that earthly realities are copies or reflections of heavenly ones, when the line of influence actually runs in the opposite direction. In other words, literal mothers and fathers have served since the beginning as archetypal origins of our various (literary or mythological) representations of god. This makes a human family the primordial theistic system, and every one of us a theist (at least starting out) in this more generic sense. With this correlation in mind, we can easily see how our developmental progress as individuals through the family system has its reflection in the cultural career of theism. We should expect to see some of the common dysfunctions in family dynamics showing up (i.e., projected upward) in the character of theism at the societal level. Referring to my diagram, let’s first notice how a parent’s role needs to progress according to the emerging center of personal identity in the child. We begin on the left in a state of ‘infantile dependency’, with our newborn experience entirely immersed in the animal urgencies of our body. In this condition of helpless vulnerability, we need before anything else to be protected, cuddled, and nourished by our parent (typically our mother). Her role at this point is to provide for our needs, to give us what our body requires to be calm, satisfied, and secure. In theism proper, this maternal providence is projected upward as the grace of god – freely and presciently giving a devotee what is needed. Give us this day our daily bread. If our parent is sufficiently attentive to our needs and provident in her care for us, we are enabled to feel attuned with her reassuring presence. This deep attunement is what Erik Erikson called “basic trust,” and it will serve as the foundation for all developmental achievements to come. In religion, such a grounding trust in god’s providence is known as ‘faith’ – not believing thus-and-so about the deity, but entrusting one’s existence to the present support of divine grace. The progression from infancy into early childhood introduces a new challenge, in learning how to behave ourselves in polite company. Our parental taller powers serve this development in us by clarifying and reinforcing the rules for social behavior. In addition to continuing in their providential role – but gradually pulling back so we can start doing some things for ourselves – they focus on prescribing for us the difference between ‘right’ and ‘wrong’, defining what it means to be a ‘good boy’ or ‘nice girl’. 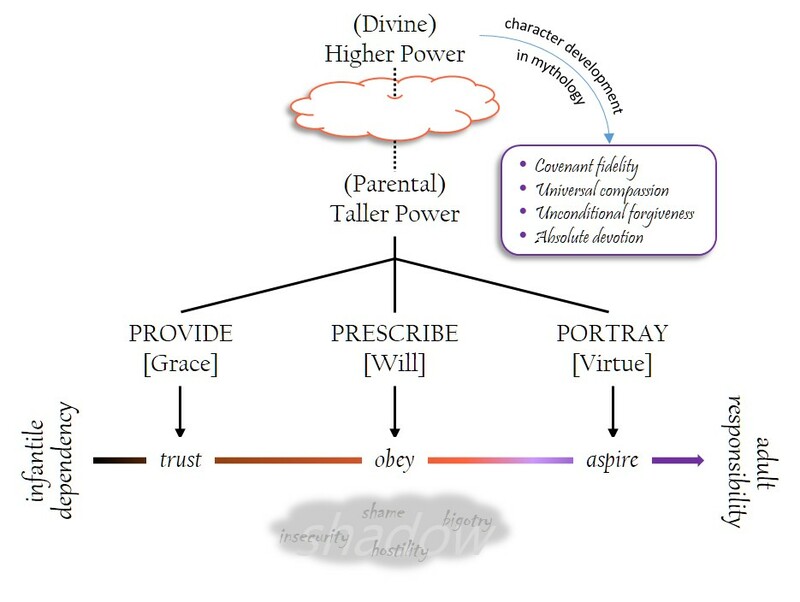 This prescriptive role of our parental taller powers is what gets projected upward as the theistic notion of god’s will. Teach us thy ways, O Lord, and show us the right path. On our side, we need to obey these prescriptions, these rules of acceptable behavior. A rule system built on the binary codes of right and wrong (with no grey between) is properly called an obedience morality, and all of us need to find our way through it. Some family systems are permissive, which can lead to insufficient clarity and motivation for pro-social behavior, producing moral complacency. Other family systems are repressive, where a child is punished and threatened for acting on his impulses or when she comes close to crossing the line. Repressive systems are responsible for the rejected and disowned aspects of personality that Carl Jung named the shadow: the part of myself that is unacceptable, censured, or condemned. To fit in and belong we find it necessary to keep all these things in the dark, behind us and down in the cellar of our personality. In my diagram, parental rules (and god’s will as their correlate in tribal religion) which are authoritarian (Because I said so!) and repressive (Don’t you even think about it!) drive down a shadow of insecurity, shame, bigotry, and hostility. This is the pathology of a dysfunctional theism which is evident all around the planet today, where true believers unleash their own inner demons on their enemies and the world around them. Ironically their moral convictions drive them in destructive ways. Let’s come back to the healthy family system – for they do exist! As we make our way through childhood, our moral development necessitates a shift from merely obeying (or breaking) rules, to orienting our focus on exemplars of positive virtue. Our parents need to portray for us such virtuous attitudes and behaviors so that we can know how to embody them and live them out. Their demonstrated virtue awakens in us an aspiration to be like them, opening our path to adult responsibility. Our mythological depictions of god are not only a projection of what’s going on in the theistic family system. The literary figure of deity also serves as a guiding ideal for an entire tribe or culture. We know that not all families are healthy, and no parents are perfect. But just as the general trend in living things is toward their mature and fully actualized selves, so the trend in theism over its long history has been into literary depictions of god that more clearly exemplify the virtues of human fulfillment. Be merciful [or in another version, perfect] as your father in heaven is merciful [or perfect]. In The Progress of Wisdom I suggested a way in which we can view several deep spiritual traditions (present-day world religions) as exhibiting our transcultural progress toward a clarified understanding of human fulfillment. The diagram above identifies these stages of awakening to wisdom in the box at the upper-right. Each stage in this broad-scale transformation was preceded slightly by a change in the way god (or ultimate reality) was depicted in the myths, theology, and art of the time. Covenant fidelity (Judaism) re-imagined deity as less elusive and unpredictable, but instead as committed to the human future by a clear set of promises and fiduciary agreements. A little later in India (Buddhism) an insight into the liberating power of universal compassion took hold. Later still, but continuing with this evolving ideal, Jesus proclaimed his gospel of unconditional forgiveness (love even for the enemy: a message that orthodox Christianity failed to institutionalize). And finally, absolute devotion (Islam) brought this progressive curriculum of spiritual wisdom to a culmination with its ideal of uncompromising commitment to a life of fidelity, compassion, and forgiveness. To appreciate this as a transcultural curriculum of spiritual wisdom, it’s essential that we see each advancing step in context of the larger developing picture. To split one virtue off from the rest only distorts and perverts it, as when Islamic extremists split absolute devotion from the fuller curriculum and proceed to engage terrorism against outsiders and infidels. Or else, as in the case of Christianity where Jesus’ radical virtue of unconditional forgiveness lies buried beneath an orthodox doctrine of salvation through redemptive violence, it gets sentimentalized and effectively forgotten. The general point is that as these higher virtues began to awaken in a few individuals, they were added to our mythological depictions of god (or ultimate reality), which then functioned for the entire community as an exemplary model of an authentic and fulfilled humanity. In its worship of the deity, a community intentionally elevates and glorifies the praiseworthy attributes of god, as they recommit themselves to being more like him in their daily lives. In becoming more godlike they are actually becoming more fully human. Obviously we haven’t been great at getting the message and realizing our true potential as a species. The complications and setbacks that affect every theistic system – the neglect and abuse, the moral repression and shadow pathology mentioned earlier – have arrested our progress again and again. But whereas some go on to advocate for the discrediting of religion and god in the interest of our human maturity, a brighter future, and peace on earth, as a proponent of post-theism I have tried to show that the way to these goals runs through theism (tribal and/or family systems) – and furthermore, that we can’t get there without it. Our present task, then, is to use our creative authority in the understanding that we are myth-makers who create (and can re-create) worlds. We can elevate an ideal of our evolving nature that calls out our better selves, connects us charitably to one another, and (re-)orients us in the One Life we all share. We need to take responsibility for a theism that will promote homo sapiens sapiens – the truly wise and generous beings we want to be. A vibrant spirituality after god (post-theos) requires that we go through god. Religion really isn’t the problem.